Benjamin Theodore “Ben” Batsford was born in Minneapolis, Minnesota, on June 5, 1892, according to the Minnesota, Births and Christenings Index at Ancestry.com, and the Certificate of Registration of American Citizen, Form No. 210—Consular, dated September 19, 1916. The certificate said Batsford’s parents provided a notarized affidavit affirming his birth information. Many sources have 1893 as Batsford’s birth year. That year can be attributed to articles on the debut of the Mortimer and Charlie strip in July 1939. The articles had profiles of Edgar Bergen, the writer of the strip, and Batsford which included their birth dates. In the 1900 U.S. Federal Census, Batsford was the second of five children born to Clifton and Jennie. His father was a house painter. The family resided in Duluth, Minnesota on Raleigh Street. According to the consular certificate, Batsford arrived in Winnipeg, Manitoba, Canada, in March 1901. The Manitoba Marriage Index, at Ancestry.com, said he married Estelle Mae Carruthers on October 2, 1915, in Winnipeg. Two of a Kind: play in 1 act, B.F. [sic] Batsford. 15 p. fol. Typewritten. [1140© 1 c. Dec. 13, 1916: D 45824; Benjamin Theodore Batsford, Winnipeg, Canada. Batsford was recorded in the 1916 and 1921 Canadian censuses. He was listed in the 1922 Henderson’s Winnipeg Directory as a cartoonist. Editor & Publisher, July 9, 1921, reported Batsford’s entry into comic strips. The Winnipeg Free Press has commenced the publication of a new comic strip by its own artist, Ben Batsford. “Unk and Billy” is the caption and the strip, eight columns wide, is appearing daily. The two characters in the strip are a man and boy of no fixed abode, who try their hand at anything that turns up. The strip is being well received locally. The Free Press is the first Canadian daily to have a comic strip of its own. Samples of Unk and Billy, also known as Billy’s Uncle, can be seen here. At some point, Batsford moved to New York City where he continued producing Billy’s Uncle, as it was known in the U.S. The strip ended August 2, 1924, according to American Newspaper Comics (2012). Ten months later, Batsford was drawing Doings of the Duffs, from June 8, 1925 to July 21, 1928. He was the second of three cartoonists to continue Walter R. Allman’s creation. …Later he drew for a time “Little Annie Rooney” [1929–1930] and after that “Room and Board” [1930; signed Benbee] which in turn was followed by “The Doodle Family” [1934–1938; also known as Frankie Doodle]. Now he enters the biggest job of his career as artist selected by Mr. Bergen to draw Mortimer and Charlie. Batsford was also profiled in the Leader-Post (Regina, Saskatchewan), July 8, 1939. The 1930 census recorded Batsford, his wife and two daughters in Brooklyn at 6826 Narrows Avenue. He was a newspaper cartoonist. Hempstead, New York, at 10 Adams Avenue, was Batsford’s home in the 1940 census. Batsford’s Frankie Doodle was reprinted in comic books. 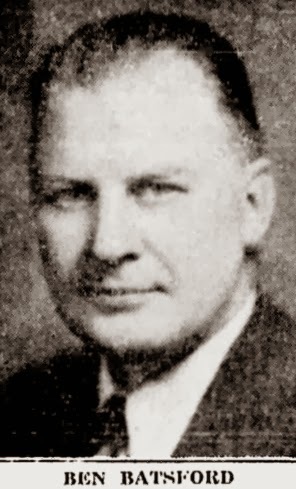 Who’s Who of American Comic Books 1928–1999 said Helpful Herbert was created by him. Batsford—Benjamin T., of East Northport, formerly of Floral Park, beloved husband of the late Stella, loving father of Fay Keaton and Ramona Bendin, dear brother of Sidney Batsford and Florence Hagan, also survived by five grandchildren. Service, 8 P.M., Sunday, Jacobsen Funeral Home, Huntington Station. Visiting hours 2 to 5 and 7 to 10 P.M., Sunday. Interment Pinelawn Memorial Cemetery. Very interesting cartooning and one of the better executed and written , at least as far as vernacular goes. Shame about the racism. Otherwise quite well put together for the time.